Oh my goodness…University-friend, Robert Waldren, posted this Youtube video on Facebook this evening!! I must confess that for the first ten years of my 30 year teaching career, I booked out the 16 mm. 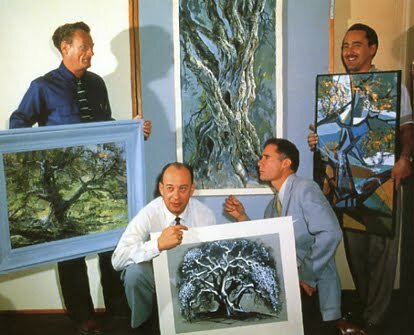 film, Four Artists Paint One Tree, from IMC. If one of my readers is a student from that period, let me know if you remember it! In the day, it was sometimes tricky dragging the equipment into the classroom, pulling down the screen, and successfully threading the movie in the projector. More than once, I looked behind the cart and found meters of film poured out onto the floor. Believe it or not, this was very innovative for the time. It makes me laugh as I listen to the background soundtrack and musical choices. After this viewing, I stressed the point of developing an individual style and even more particular to that, determining your favourite mark making tools and marks. One of my art teachers had really made an impression with me regarding mark making some time before 1976. This film was originally made in 1958: Walt Disney made observations of how Marc Davis, Eyvind Earle, Josh Meador and Walt Peregoy each painted one tree and background. LOVE THIS!! This was a huge walk down memory lane and I thank you, Robert Waldren! It seems as though every artist has particular subjects that they draw and paint over and over again from their earliest explorations, discovering an approach to things…for me, it was a tree and an eye. It is no wonder I was drawn to this movie. What amazes me is that as I search, I learn how many people have written about this particular film. This entry was posted in Creativity, Fine Arts, Memory & Nostalgia, Observations of Nature, Painting, Teaching and tagged 16 mm., 4 Artists Paint 1 Tree, Eyvind Earle, film, Four Artists Paint One Tree, Josh Meador, Marc Davis, screens, Teaching, Technology, Walt Disney, Walt Peregoy by Painter Lady. Bookmark the permalink. I was never your student, but I remember this film from elementary school in Ontario. I really liked it, I identified with the cubist style artist at the time. Thank you for sharing.